You may be wondering where I've been lately. Truth is, I've been struggling. I have never suffered a loss so impacting as that of my mother, and I am currently deep in the trenches of the grief experience. I didn't realize it until now, but grief actually gets harder before it gets easier. A few months after the loss, you actually experience more pain than you did initially. I know this because not only am I living it first-hand, but I'm also currently in therapy where a professional counselor has helped me attach a name to what I'm going through and elucidate the whole process. Side note: Psychological therapy is wonderful and everyone can benefit from it. I highly endorse it. The first phase of grief is shock, and you tend to feel more numb than anything. You lose your appetite, you have emotional outbursts, but you're mostly in denial. It's a protection mechanism. Once all the dust has settled, you're left in the protest phase, and that's where I am now. It's exactly what it sounds like. You are angry, you yearn for what is lost and you can barely think of anything else. You experience an increase in the shock symptoms mentioned above as well. 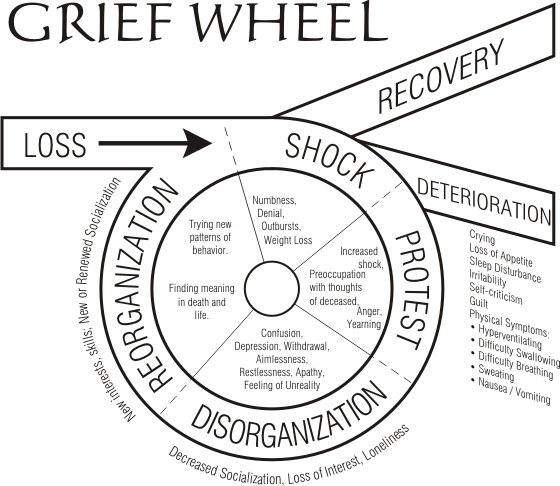 On top of it, the physical effects of grief begin to take their toll. You feel extremely tired, you are in physical pain and you have a constant headache. You move into disorganization, and you can see above just how fun that phase is. So, if you're wondering where the heck I've been, the short answer is at the bottom of a deep, dark pit of despair. Naturally, a trying experience like this can easily result in a questioning of faith. I'm about to get real honest here, so be prepared. Spiritually, I have felt torn between wanting to be my very best and continue to do all the right things so I can be centered with my Savior, who can continue to carry this burden for me. Also, there is a motivation to one day be worthy of being with my mom again, because there's no doubt she made it to heaven. But another part of me -- the depressed part -- is too tired to go on. This part doesn't see the point in studying the word of God, attending church, praying or anything "churchy." This part of me is so exhausted, she just wants to cry, sleep, feel angry and do nothing. And often, this is what happens. When a representative from Deseret Book reached out to me to review Sheri L. Dew's new book, Worth the Wrestle, I was hesitant to accept. Don't get me wrong -- I love Sister Dew and her inspired, prophetic words, and it seems like they always find their way to me whenever I need them. But I could tell by the title that I would feel moved to make some changes once I finished the book. Problem was, I didn't know if I would be physically able to act on my impressions. See, depression is a tricky thing in that it immobilizes you from doing even the simplest tasks. So, I didn't want to open myself to receiving a spiritual prompting and then find myself unable to follow through with whatever it would require. Something to do with my perfectionism and fear of failure, I guess. A little over a week ago, leaders of our stake came to our congregation to deliver sermons and lessons specifically targeted to our needs. I had been so frustrated with this new depression, as I drove myself to church that morning, I lamented out-loud. I said, "God ... I am going to church today, even though I don't want to. Please send me some comfort, peace -- anything so I can know that this is all worth it." I've found in my life that when I am very sincere in my prayers, I get answers. I know others may not experience this and I don't intend to pass judgment on them for their struggles. I can only speak for myself and for me, this is true. I consider it a spiritual gift, one I honestly do not tap into enough. Within hours of asking, my prayer was answered. What topic did the stake president choose to address with the adult Sunday School? Was it something to make me feel even more inadequate, like the importance of scripture study, service, church and temple attendance, fulfilling callings -- all the things I had been struggling so mightily to understand their value? No. His lesson was about depression. And not how it's some shameful, hush-hush thing tied to unworthiness, but how it's actually a common, widespread issue many people suffer with and how we need to be more open, understanding and loving in how we accept and manage it in our families and congregation. We watched the video below and discussed it. Many people shared their personal experiences. I wanted to, but I couldn't. I could only sit with tears streaming down my face, fully knowing that God is aware of me and loves me. Later, my mom's cousin Kimberly, the stake Relief Society president -- she leads the women's organization -- presented a lesson to us about the very concept Sister Dew addresses in her book. And actually, she specifically mentioned Worth the Wrestle, which was a big fat sign from God that I needed to just buck up and read the book. So, I did. Amazingly and miraculously, I did. The book is short and written in a conversational way that makes it quite easy to read. You can just imagine Sister Dew sitting across from you in your living room, holding your hands and talking to you in a direct yet loving way. It feels like conversing to your best friend as you take in her poignant words. The premise of the book is simple -- no one is going to pass through life without ever questioning what they believe. No one. Life is just hard, and the things we encounter will often confuse and deter us. But, it's what you do when you're in the midst of the refiner's fire that makes the difference. Do you acquiesce to your doubts, or do you wrestle with them? Wrestling requires humble seeking, studying and praying in earnest. It's difficult and uncomfortable. Throughout the book, Sister Dew shares many heavy questions she's had regarding Church doctrine and history, and how she humbly searched, studied and prayed on repeat to get a personal witness from God on these matters. It's humbling and also encouraging to read how such a spiritual giant as Sheri Dew can have struggles akin to my own. It gives me hope that I can also find reassurance. Chances are, you are also going through something that's causing your spiritual foundation to shake. Maybe it's a death, or divorce, or a health challenge, or a loved one who is causing you pain. If you're not struggling with something, you will be. It's just the nature of life. And when those storms come, you can be prepared. Worth the Wrestle asserts that not only can you come to grips with your faith amidst a crisis, but that it's worth it to hold onto it. It just requires you to do some serious legwork. I now feel empowered to slowly but surely take those steps back toward God, back to those things that once brought me comfort and strength in difficult times before. I know I can do it, and I know my questions have merit. God is ready to answer them if I am willing to do the work. I believe it's worth the wrestle. This post is sponsored by Deseret Book. Expressed opinions are, as usual, 100 percent mine. Oh sweet Jenna. Thank you for this. I'm so sorry it's all so hard right now. I'm SO glad you're seeing someone. Talking helps so much. I love you. Thank you for sharing your beautiful and honest testimony. I have been waiting for a quiet afternoon to come read this. And I can only imagine the pit of grief you find yourself, but I am grateful you got those answers to your prayer. All for just going to church, a primary answer of how we show our love and commitment to God, yet it was so profound for you and I knew I needed to read about it. Jenna, thanks for being you! Thank you, Rachel. I'm sorry I'm only seeing your comment just now. That was a moment I will never forget! Thanks for staying in touch ... I sure do miss you!